CockpitWeb was finalist in Flight International's Aerospace Industry Awards 2005! "Allow me to congratulate you for the quality, robustness, and great accuracy of your software. I like the great tutorial, the ease of use, and the Autotrim that removes all the frustration associated with the typically unstable pitch trimming found in most simulators." no blabla - it comes directly to the point." "Your book and the computerized exercices are very interesting by providing tricks to help the IR or future IR pilot." "What is great is the exercise part linked with the tutorial book and to have 1 software for conversions, mass and balance, exercises and simulator. Real value for money!" CockpitWeb - IFR Training Software: IFR Simulator + IFR training course + interactive IFR exercises + more... ! Programmed by airline pilots and flight instructors! - Reduce your flight time & save money! - Become a better pilot! Become an IFR expert! The CockpitWeb IFR Training Software is a professional IFR training method, developed by experienced airline pilots. This ‘home trainer’ for pilots includes a complete IFR course and is the ideal tool to learn or improve your IFR theoretical knowledge, train your instrument scan, exercise IFR procedures and improve your flying skills. As a result, your flight training becomes easier, you will reduce flight time and save money! If you want to become a better and safer pilot and you are looking for the best training, then use CockpitWeb IFR Training Software! - an IFR training ebook (87 pages PDF-file) describing the IFR theory. - 70 interactive computer-based IFR exercises to practice IFR procedures, improve your instrument scan and your mental skills. - the convenient reflight Preparation: navigation log, mass & balance and conversions. - the handy Pilot Guide. - This software has been developed by airline pilots. The All-in-one IFR Training Software is unique! If you want to become an airline pilot or get an IFR-rating, this software is what you need! You will learn all about IFR at home and stay one step ahead of your training. - Easy way to learn about radionavigation and IFR-flying: a step-by-step training method. - Reduce your flight training cost. The IFR Training Software costs less than 15 min of IFR flight! This pilot training software was finalist in the prestigious Flight International Magazine Aerospace Industry Awards 2005 for its "innovation and excellence" in the General Aviation sector! The IFR Training Software offers high quality training for a very competitive price. The program costs less than 30 minutes of IFR flying. By using the IFR Training Software you will save many hours of flight! The IFR Training Software is easy to use. You'll only need a few minutes to get started. We have kept the simulator as simple as possible.We want you to focus on flying, not on learning the program. This ebook of 87 pages contains more than 100 illustrations. The ebook is divided into 13 chapters: Basic instruments, instrument flying, navigation, radio navigation instruments, tracking, interceptions, DME arcs, holdings, ILS approach, non-precision approach, initial and intermediate approach, departures and flight considerations. The theory is explained using examples, it is easy to read and fast to study. It was written to enable self-study. In a couple of hours you will learn all about instrument flying, radio navigation and IFR flying! The manual deals with subjects as HSI, RMI, MSA, RVR, PAPI, VASI, missed approach point, approach ban, decision altitude, minimum descent altitude, visual descent point, holding and holding entry, DME arcs, ILSs, non-precision approaches,… and much more. In short, this manual deals with all aspects of IFR flying. "The manual is an excellent summary of the essential theory of instrument flight and is particularly handy because it manages to combine a comprehensive approach with compactness. It gathers information into a single reference volume and lets you in on the pragmatic tips instructors use to help students handle the mental gymnastics that are a feature of instrument flight. The material is arranged in the logical sequence typical of a real-world training syllabus, starting with the basics of attitude instrument flying and closing with the complex subject of holding patterns." PC Pilot Magazine, U.K.
"La documentation accompagnant le logiciel fait partie intégrante du concept <IFR Training Software> puisqu'elle intègre à la foix une notice détaillée, mais aussi une partie tutoriale fort bien expliqués et illustrés." (Translation: "The documentation that comes with the software is an integral part of the <IFR Training Software> concept, because it integrates at the same time a detailed user's manual, but also an instructing part that is very well explained and illustrated.") Microsimulateur, France. In addition to the theory explained in the IFR training ebook, the IFR Training Software offers more than 70 different exercises divided into 10 chapters: Instrument flying, radio navigation, tracking and interceptions, DME arcs, holdings, ILSs, non-precision approaches, arrivals and departures. The CockpitWeb IFR Training Software offers nearly unlimited exercise possibility. For most of the exercises, the computer automatically generates as many variants as you want. The exercises are either static exercises or fly exercises. "The software's biggest attraction is its series of practical exercises, which grade you as you fly and follow a logical instruction syllabus. Programmed exercises start with the basics and progress to the complex." PC Pilot Magazine, U.K.
Static exercises are mental and procedure trainers and check whether you understand the theory. They require you to make a calculation and fill in the result. Then the computer generates another exercise of the same type. You can make as many different exercises as you want while the computer keeps track of your score. Fly exercises allow you to fly a procedure in real-time using the simulator. The program automatically puts the airplane in a position and changes the instrument set-up making life very easy. Just click the start-button and start flying. Click the 'NEW EXERCISE' button to generate another variant of the same exercise and the computer will randomly position the airplane and take care of the instrument set-up like frequencies and course settings. "The IFR Training Software is a solid training aid for students - and instructors - of instrument flying, particularly where new concepts and procedures are being introduced for the first time. I could see myself recommending this software to instrument students and using it as part of a training syllabus, demonstrating new material and assigning exercises to build the student's confidence and highlight deficiencies to be addressed before jumping in an airplane. The Autotrim feature is excellent for students being introduced to tricky - and initially overwhelming - concepts such as determining how to apply mnemonics including 'Pilot-Teacher-Dummy' and 'NDBTOP' to plan / enter a hold and then stay in protected airspace despite crosswinds." IFR Simulator: Unlimited IFR training! Improve your flying skills, make your IFR training easier and prepare for airline simulator assessments. The Cockpitweb IFR Simulator Software provides unlimited flight training for a very competitive price! It includes a worldwide navigation database, large, easy-to-scan instruments with adjustable instrument panel, horizontal and vertical maps, autotrim, 3 different turbulence modes and an ingenious startposition panel. The IFR Simulator is included in the IFR Training Software. Preflight Preparation: Fast, easy and safe calculation of navigation log + mass & balance + conversions! The Preflight Preparation is included in the IFR Training Software! It includes a Navigation log, Mass & balance and Conversions. Now it only takes seconds to prepare a flight! This program automatically calculates the wind drift and wind correction angle, groundspeed, elapsed time and even fuel consumption for each flight leg as well as the total flight time and fuel consumption. It’s also very handy to make last minute changes. Did the wind change? No problem: insert the new wind, click the button, print the flight log and you are ready to go! This very handy program automatically calculates the total mass of the aircraft and the centre of gravity position. It’s very handy to reposition passengers and luggage or adjust the fuel and immediately see how the mass and centre of gravity move. It can be used for any type of airplane, single or multi-engine, that can carry up to 6 persons. It can be printed and saved. Whether you want to convert nautical miles into kilometers or pounds into kilograms. The program includes more than 90 2-way conversions (180 conversions). Free Pilot Guide: Instant access to essential information! The Pilot Guide is included in the IFR Training Software. The pilot guide is a handy summary that contains all that a pilot should know and all he tends to forget. A handy and essential summary for pilots bundled in a few pages, containing METAR & TAF codes, significant weather, snowtam, chart symbols and abbreviations, flight plan codes, rules of the air, VFR weather minima, visual ground signals, marshalling, morse code, flight plan codes... and more. Carry this guide in your flight bag and you instantly find the answer to all your questions. Order the Cockpitweb IFR Training Software and you automatically receive a Free Copy! (Printable PDF file). 5) How do you write on an ICAO flight plan: transponder equipment is mode S with aircraft identification transmission but without pressure-altitude transmission? 6) What is the minimum VFR flight visibility in class C airspace (ICAO rule)? 7) What is the minimum VFR flight visibility in class E airspace (FAR rule)? 8) In flight, you see a flashing white control light signal. What does this mean? "An ideal tool for serious students of fixed-wing instrument flying. The printed material provides an excellent summary of the theory of instrument flying, punctuated with valuable suggestions and hints. It also links effectively with the simulator's programmed exercises that will test whether you really can apply the instrument flying theory you've learned. " (Review of Cockpitweb IFR Training software version 1.0) PC Pilot Magazine, U.K.
("An amazing product. The advantages of this product, created by and for pilots, are indisputable. A very complete package.") Translated from: "Un produit très surprenant. Les atouts du produit, conçu par et pour des pilotes sont indéniables. Un package très complet." 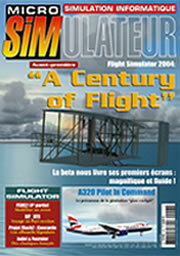 Cockpitweb IFR Training software version 1.0 was reviewed by MICROSIMULATEUR magazine, France, the French flight simulation magazine. You can read the review in their december 2003 issue.